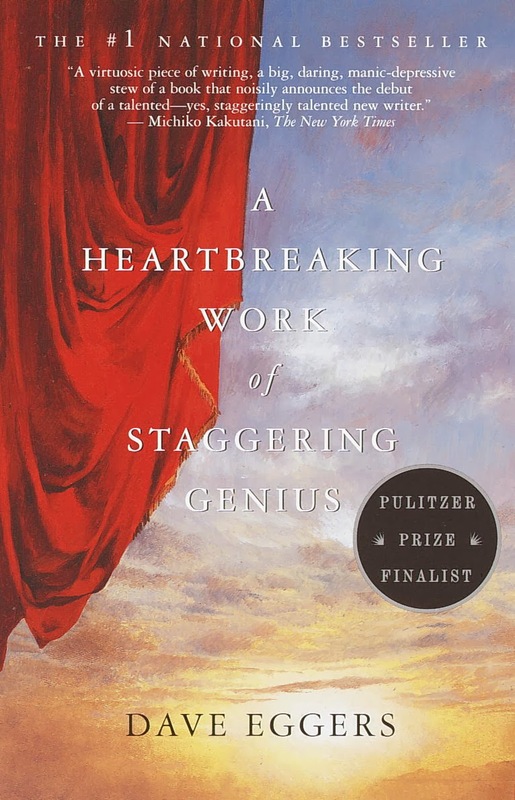 Random And Some: "I am twenty-four but feel ten thousand years old"
"I am twenty-four but feel ten thousand years old"
Yesterday I finished A Heartbreaking Work of Staggering Genius (2000) by Boston native Dave Eggers. I stumbled upon it via Buzzfeed's 65 Books You Need To Read In Your 20s and was immediately drawn to it. [In case you are interested: I also reviewed Never Let Me Go and On The Road.] Eggers' fictionalized memoir reeled in a Pulitzer Prize nomination, was named the 12th best book of the decade by The Times, and helped launch the bestselling career of its author. Within five weeks, Dave and his siblings, Bill, Beth and Toph, lose both of their parents to cancer. The foursome soon leaves their childhood home in Chicago, uprooting to San Francisco and Los Angeles in an attempt to start anew. Dave, at the tender age of 21, is appointed unofficial guardian of his eight-year-old brother Toph. In between his role as a 'single parent', with a massive responsibility toward Toph's upbringing as a normal human being, and his own attempts at young adult life, Dave desperately tries to cope with the untimely deaths of his Mom and Dad. #AHWOSG was such a great read. I can't even begin to imagine how absolutely, immensely , completely unprepared I would be to take on a similar task, and there is no way that I could even begin to understand the tectonic shift of responsibility. The self-aware and cynical writing of Eggers flows like thoughts, which might get old quick for some, but might just as well be what keeps you reading. Which side are you on?